by TotalSim’s Ivor Annetts, Bernoulli Magazine, Jan 2014. Traditionally Computational Fluid Dynamics (CFD) has sold itself as a ‘digital wind tunnel’, offering aerodynamicists the chance to test new ideas and to study flow structures around a car before taking that knowledge into an actual wind tunnel. CFD fell into this roll as limitations in technology meant that it was time consuming to analyse a car at more than a single attitude (ride height and roll, yaw and steer angles). Furthermore, many details of the car were ‘de-featured’ to make it easier to generate the CFD model and meshes lacked sufficient refinement to capture smaller flow structures. Computational Fluid Dynamics has changed radically over the last ten years, meaning that this traditional view of CFD no longer holds. Advances in CFD software and hardware mean that CFD models are now fully detailed. Cars are regularly analysed across multiple attitudes and more of the ‘real’ physics of a race car are included in the model. Since its founding seven years ago TotalSim have driven forward race car CFD preferring to view their models as ‘digital race cars’ – detailed representations of the real world car – providing aerodynamicists with knowledge of how a car is likely to perform on the track and not just in the wind tunnel. 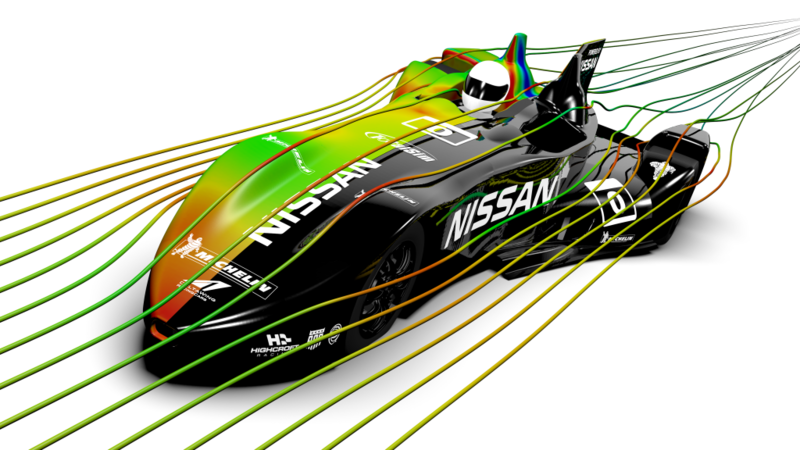 The Nissan Delta Wing went straight from CFD to full scale. Building a CFD model used to involve many man-hours of tidying cad, intersecting components and producing a high quality surface meshes before any volume meshing and solving could be attempted. A new full car model build might have taken 30 man-days to complete and additional runs taking another man-day to prepare. Modern pre-processing software such as Beta CAE’s ANSA have streamlined much of the work involved in the preparation of geometry. Additionally, codes such as snappyHexMesh in ESI’s OpenFOAM®** generate both the surface and volume mesh and do not require CAD that has been perfectly intersected. Developments such as these mean that the time taken to produce a complete race car from scratch has been halved despite much more detail being included. Minor modifications to the car can now be made in a matter of minutes whilst major bodywork updates can be completed in a few hours. There have also been advancements in the use of laser scanning and the preparation of models using STL data. This means it is possible to make detailed models of a race car even if no CAD surfaces are available. This approach has a particular advantage in that the scan will include details such as imperfect panel fits and warped geometry that exist on the actual car but not in the original CAD. When building a model of a race car it is possible to create a kinematic model of the suspension meaning that the race car can easily be adjusted to different attitudes. Not only will the kinematics move the geometry, but it will set all the necessary CFD meshing parameters and model boundary conditions, producing a model that is ready to mesh and solve with minimal input from the engineer. With the CAD prepared and the kinematics configured, an engineer can simply select the geometry they would like to include on their car and the attitudes they wish to run at. Automated software will then build the model of the race car, check it for any errors and then, once it has meshed and solved, post-process the solution. This degree of automation maximises the amount of time an engineer can spend analysing flows and designing new components. It also minimises the risk of human error in the model setup. Parametric shape optimisation now plays a major role in any development programme. Software such as Optimal Solutions’ Sculptor allow freeform deformation of complex geometry and can be used to drive multi-parameter shape changes. This is coupled with optimisation software to perform complex trade-off analyses revealing performance gains that might be difficult to find by manually changing geometry. An example would be optimising for minimum straight-line drag whilst simultaneously maximising mid-corner downforce, controlling aerodynamic balance shift and maintaining sufficient cooling; difficult with one geometric parameter let alone six spread across multiple components. computing costs and the time spent on analysis and reporting. Smaller scale projects can also achieve these costs with another study containing over 150 runs for a budget of £25,000. This rate of development can easily outperform that of the wind tunnel. A recent motorbike project at TotalSim broke its own record for condensing a design programme into a previously impossible timescale; 366 unique design changes were analysed in 5 working days. 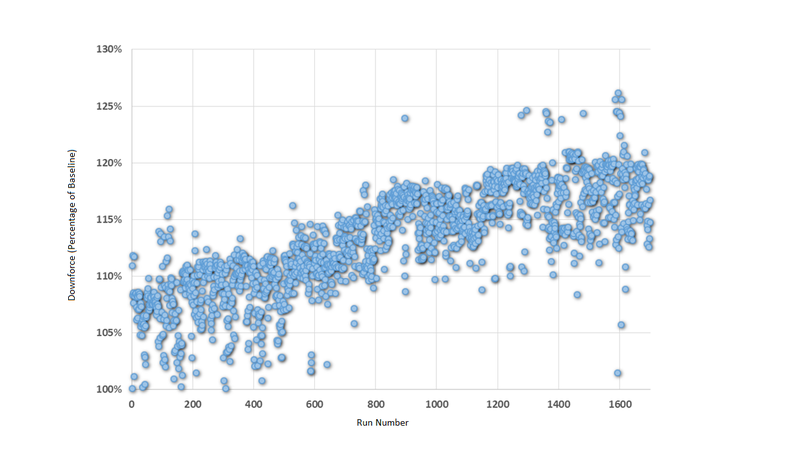 As computers become ever more powerful and cheaper the number of CFD runs that can be completed within a given timescale and budget will only increase. TotalSim have recently built its latest generation of cluster using off-the-shelf components. This machine, costing £55,000, is capable of meshing and solving eight full car models a day, all with no additional license costs due to the use of Open Source CFD software. Running costs are 5p/core hour, cheaper than current remote computing centres which can cost up to 10p/core hour. The amount of physics that is routinely modelled in a CFD simulation is likely to increase, making a more realistic representation of the real world. Race cars are already being modelled in true cornering flow as opposed to simple yawed wind and thermal modelling can provide more accurate predictions of cooling and exhaust flows. Currently steady state simulations are used for routine development with more computationally expensive transient simulations completed on key runs. Increased computer power will likely make transient simulations the norm and, if this is the case, it opens up a number of exciting possibilities. It may well be possible to model dynamic events such as braking, or even modelling the car as it moves through a complete corner including vibrations and tyre deformations. Flexing or fluttering components could also be routinely simulated especially if the CFD model is coupled with a structural Finite Element Analysis solver. Increased computing power could also allow rapid mapping of a race car’s aerodynamic performance and could be coupled with lap simulations or driver-in-loop simulators to provide answers on how design changes affect lap time rather than just metrics such as downforce and drag. There has also been a drive in many aspects of computing to the ‘cloud’, where data is stored on remote servers, and is accessible from anywhere in the world. 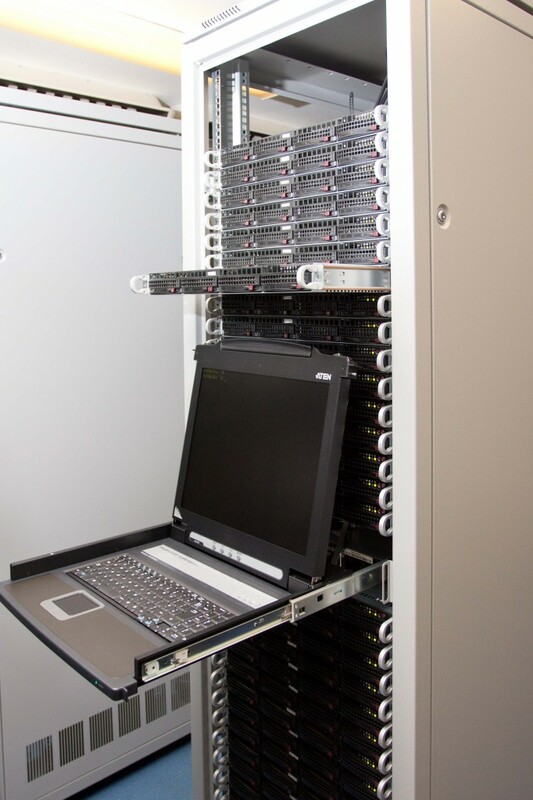 Cloud computing resources are making high power clusters readily available such that it is no longer necessary to buy and maintain your own equipment. For CFD this might mean that a race team could simply upload their latest design changes for testing, request aerodynamic mapping data and access the results from anywhere in the world. The modelling of race cars using Computation Fluid Dynamics has changed massively over the past ten years. The advances made in this field have changed CFD from being a precursor to the wind tunnel into a cost effective tool that provides detailed simulations of real world race cars. This has been made possible by increasingly powerful computers, more advanced and automated software and ever more realistic models. As technology continues to advance it is clear that CFD is only beginning to unlock its potential. Many thanks to Bernoulli Magazine for allowing us to publish this on our website.